"A bold and confident new chapter"
Talking of hunts, the basic recipe - grab a hunting contract from a notice board, stock up on armor upgrades and head out into the wild - remains intact. But Capcom has wisely made some subtle changes that make this the most approachable and - dare we say it, forgiving - Monster Hunter yet. On the surface, the new Scoutfly navigation system's glowing trail seems like a trope you’ve seen a hundred times before, but here it helps temper an issue that’s dogged the series for years. Monster Hunter’s hunts have always been a hoot, but knowing exactly where to go was often an exercise in luck and frustration. With this neon breadcrumb trail in place, the minutiae of the game's levelling systems (which reward time spent in the field tracking monster trails, collecting local fauna and more) are properly revealed. 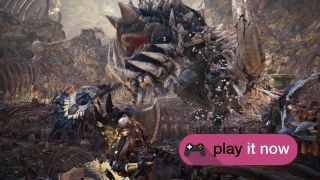 While Monster Hunter World's combat often feels as rigid as its ever been, it’s an enduring system that rewards hunters who learn their prey’s attack patterns, rather than button bashing through every battle.